April is usually the first month were we consistently get out in the gardens, and where all our prep work over the winter moths pays dividends. Our pea fencing is all ready in place for when we plant out our peas. We’ll be sowing our fruiting crops, courgettes, cucumbers, squashes etc and later in the month we’ll be sowing linseed, grains and a selection of onions. We took full advantage of the good weather at the end of March and planted the first of our main crop potatoes for our conservation work. Our apple tree nursery is getting a makeover this spring, new curbing, protective fencing to guard against hares, new concrete posts and tree sections are all being built this month. Apple tree maintenance is of high importance this month and we’ll be tidying up our last bits of pruning and disposing of any diseased cuttings. We’ve just finished up our grafting for the year ahead and during April we we will be pinching out rootstock shoots, applying clips to ensure straight growth and setting up irrigation systems. Over the last couple of years we DNA tested our apple tree varieties and now the hard work begins. We are comparing these results with other European databases and collections to chat the unique history and stories behind these varieties. 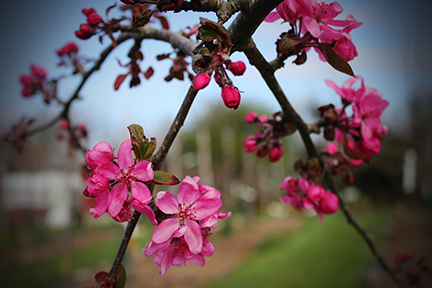 Apple trees are usually one of the last fruit trees to come into full flower, with the exception of a few varieties. One of these varieties is the Lough Key Crab. It’s vibrant coloured blossom is one of the main reasons why this crab is so popular.